Our goal is for states with legal marijuana to adopt the Green Cross as their Universal Safety Symbol to go on all cannabis-edibles. We're answering the important questions about edible safety! Who should mark their edibles? Anyone who cares about edible safety! At this point in the industry there are many cannabis-infused foods on the market that look identical to regular food, are highly potent, and don't give off the taste or smell of marijuana. This creates a situation where children and adults accidentally consume edibles because they had no way of knowing the food contained cannabis. Students in Maine have even expressed concern "that they may unwittingly be offered marijuana candy by a peer as a teenage “prank.”"
A 5th grader in New Mexico brought a package of edibles to share with her friends, with no idea they contained cannabis. In a similar —but much more troubling— situation, a 12 year old is facing felony charges after handing out edibles to fellow students (which resulted in 5 hospitalized). Officials say it's unclear whether the student even knew the gummies contained THC! In legalized states there has been an increase in ER visits resulting from kids accidentally eating cannabis-edibles and a rise in calls to poison control centers. All across the country there are reports of THC-infused foods making there way into schools and communities. Kids have been exposed to unmarked edibles at a quinceañera, on the ground at a park, and even on the school bus. On the same day 9 students in Ohio were taken to the hospital after being given marijuana-infused gummies, 15 students in Oregon were sent home for eating edibles. But it's not just kids who have to worry. After eating two unmarked brownies that turned out to be cannabis-infused, a man in Minnesota was randomly drug tested and fired from his job as Information Technology Specialist. The U.S. Court of Appeals for the Federal Circuit upheld the ruling, setting a precedent that it is legal for employers to fire someone for testing positive for THC – whether it was an accident or not. What does marking edibles do? Allows children and adults to identify a cannabis-infused product outside the package. Proper labeling (making sure the product isn't being marketed toward kids) and packaging (ensuring the container is childproof) are definitely important first steps when safeguarding edibles. However, no matter how well the package is labeled, once a cannabis-infused food is removed from it's wrapper or container it looks identical to regular food. No matter how responsible you are about keeping edibles securely stored, you have no way to hold other people accountable, and sometimes cannabis-infused foods end up outside their original packaging. On October 1st, 2016 new regulations went into effect in Colorado that require cannabis edible manufacturers to mark all infused products with a THC! symbol on the actual food product so they are easily identifiable as a marijuana product. Since then, Massachusetts and Nevada have followed their lead, creating their own "Universal Symbols" that are required on every cannabis-infused product. This is a great step in the right direction, however we believe, along with many industry experts, that the THC! 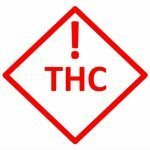 symbol is not going to be effective for stopping children from accidentally consuming cannabis, which is one of the biggest concerns facing legalization efforts currently. After Arkansas voted to legalize medical marijuana legislators proposed an outright ban of edibles. Lawmakers, parents, and lobby groups continue to cite the dangers of accidentally ingesting cannabis edibles as a major reason that marijuana should stay illegal. Celebrities usually in favor of cannabis such as Bill Maher even think that unmarked edibles are holding back legalization efforts. Although Colorado, Nevada, and Massachusetts are the only states to require edible safety symbols, edible producers who want to put safety first across the country are proactively marking their edibles with Green Crosses! A universal symbol should be easy to recognize and associate with cannabis. If you go to any state where marijuana is legalized you are guaranteed to see Green Crosses. They are in the windows of dispensaries, headshops, and on cannabis billboards. On the other hand, you will not see the !THC symbol anywhere outside of Colorado, and even within the state there is no educational campaign to educate children on the meaning of the symbol. Most adults don't know that THC stands for tetrahydrocannabinol, the main psychoactive component of cannabis that gets you "high," and most children three years old are just learning the alphabet. Many industry experts have expressed concern that the symbol will not be effective. The Green Cross is also widely used across Europe, as well as Japan and Mexico, to indicate medication. Studies have shown that children as young as three can associate meaning with symbols and brands that are prevalent in their environment. This means that a child is much more likely to recognize, and more importantly understand the meaning of, symbols that they see more often rather than a symbol they are just introduced to. Because of how prevalent it is in the industry, the Green Cross is easy to associate with marijuana or medicine, which is what cannabis is for many people. Children can be taught never to eat anything marked with a Green Cross because if they do it will make them very sick. If you are an edibles producer outside of Colorado, Massachusetts, or Nevada you can help prevent accidental consumption by marking your products with Green Cross safety symbols. This is a great way for your cannabis business to show that you are proactive, responsible, and put public safety ahead of profits. Whether using Cannacals™, molds, printers, lazers, or other methods, please join us in our efforts to create positive change in the cannabis industry by adopting the Green Cross safety symbol! If you are concerned that your state is not requiring edible makers to mark their products outside the package you can contact your state legislators here. 1. Let them know that you do not want unmarked edibles in your community because they pose a potential danger to you and your children. 2. Remind them that it is easy and inexpensive for edible makers to mark their products, and in Colorado they are required by law to do so. 3. Urge them to adopt the Green Cross as their universal safety symbol because it is the most effective symbol for recognizing a cannabis product. Green Cross Initiative, Proudly powered by WordPress.